Welcome to the MuTokuKan website. Here you will find information about our Aikido courses in Trieste, Udine and Monfalcone (Italy), our Association and seminars in Friuli-Venezia Giulia and neighbouring regions. You will also find schedules of our lessons and other news about this martial art and Japanese culture. We are looking forward to meeting you and practising together! Quality, experience and passion for Aikido. 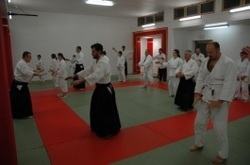 The MuTokuKan Dojo is active in the provinces of Trieste, Udine and Gorizia, organizes over 400 hours worth of courses per year and regularly hosts internationally renowned masters of Aikido. Alessandro Chiancone V Dan Aikikai - So Hombu Dojo Tokio. Judo practitioner from 1961 to 1982 (yudansha) and practitioner of Thai Chi Chuan at the school of Master Tew Bunnag in Barcelona (Spain) from 1987 to 1990. Aikido practitioner since 1989. In 1991 he spent a whole year in France as an internal student (uchi-deshi) with teachers Benedetti Sensei and N. Tamura Shihan Sensei. During this period he attended courses and seminars taught by these two teachers in France and Europe. In 1992 he founded the MuTokuKan Dojo and it is affiliated to AIKO of Rome. He travelled in the United States with Y. Yamada Shihan to deepen his practice and spent a short period at the NY Aikikai. In 1998, the MuTokuKan Dojo became affiliated to CSEN. In the same year he became the CSEN provincial delegate for Aikido in Friuli-Venezia Giulia. 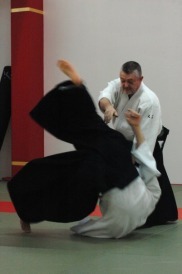 Since 2001 he has been the Aikido regional manager. Aikido is good for the body, mind and heart. Aikido is a dynamic, elegant and non-competitive martial art which can be practised by people of all ages and fitness levels. The quality and experience of MuTokuKan’s teachers ensure safe and correct practice. Classes are held in a peaceful and friendly atmosphere. To get started, you just need a tracksuit and a pair of sandals. The practitioners wear a keikogi, (similar to judo dress) and experts wear a hakama, a kind of traditional Japanese dress pants. After making the initial bow, a typical lesson includes a period of breathing and a warm-up, learning how to prevent dangerous falls (ukemi) and then the practice itself, which is done with bare-hands or using three different types of wooden weapons: the knife (tanto), the stick (jo) and the sword (bokken). The lesson ends with a brief relaxation and the final traditional bow. During practice, the teacher shows the students the techniques and the students repeat them in pairs, alternating the roles of performing the technique (tori) and receiving it (uke). The teachers observe, correct and constantly help all students, with their experience and example, and more advanced students help the new arrivals. Visitors wishing to observe or, even better, try 3 free lessons are welcome; we also welcome you to ask questions of the instructor or any member of the dojo.